During their development period all of our pups are introduced to livestock as part of their socialisation. So on Sunday the E litter met up at HQ before heading off to the venue we always use Saundercroft farm. Pictured from left to right are Errol, Ernie, Eyke, Echo, Eddie and Star. The E litter turned 5 months this week and Star one of our imported dogs from Holland is 7 months. Star was unable to attend the training session scheduled for his own group later in the week and so I thought it would be good for him to join us on our visit to Saundercroft farm. He has had some confidence issues and I thought it would be a good opportunity to see if his general confidence is improving. I was pleasantly surprised at how well he did. Our visit to Saundercroft farm is always one of my favourite development days. Exeter Police dog handler Andi Darbey lives on the farm with her partner Simon and 2 year old son Will. The farm is owned by her mum Jean who kindly allows us to visit. The objective is to socialise the pups with the different types of livestock and it gives me a very good measure of the general confidence of the pups. It also helps me to identify any pup that could potentially be a problem around livestock in the future and may need further development in that area. It is very important that our Police dogs are not reactive in and around livestock because searching for offenders and vulnerable missing persons is a big part of our work in this area. The initial reaction of the pups when they first meet livestock varies from excitement, wanting to chase, barking, raised hackles, uncertainty to backing off. This group showed no uncertainty and were certainly not backing off. We are lucky to have Andi, Simon and her mum Jean because not only do they let us onto the farm they also play an active part in helping us to introduce the pups to the animals. It is always entertaining watching the pups and the animals but in our more recent visits it has become even more entertaining watching 2 year old fearless Will charging about and generally gate crashing anything that takes his fancy. We usually start with the sheep in a field and our strategy is always the same. We keep the pups on lead a short distance away from the sheep and we prevent the pups from becoming too focused on the sheep by practising exercises such as the sit, the down, looking at the handler and short recall’s on lead using our liver titbits. Andi uses her bucket of feed to get the sheep to congregate and this stops the sheep charging about and means the pups are less likely to get over excited. I had Ernie for the day because his puppy walker Dave was a little unwell and was disappointed not to be there. As you can see from the video Errol got a little bit excited in the early stages. We don’t rush the process and eventually the pups became generally bored with the sheep and so our is mission accomplished. Ernie was a little anxious when I picked him up from his puppy walkers for the day and I wonder whether he was worried he was changing home for a 4th time. He soon settled down when he saw his siblings and really enjoyed the day. Here he is sharing a drink with Echo and relaxing with Star. Having achieved our objective with the sheep we all made our way down to the calves and cows. On the way to the cow shed Ernie spotted a cow and some calves in a field and very calmly weighed up the situation. In the cow shed he was even more chilled out. Mind you he wasn’t the only one all the pups seemed to take it in their stride. For some reason Echo found this cow particularly interesting. As always Will was never far away from the action. Here are Eddie and Ernie relaxing on the hay bales. Here is a short video clip of the pups in the cow shed. It was a hot day and so plenty of water was always on hand. Errol wasn’t that keen drinking out of this bucket after everyone else had been drinking from it. So Errol found a larger bucket and tried to practise his underwater swimming inside it. As always that man Will was there again enjoying the action. Eyke doesn’t seem too fazed by this rather large horse and almost seems to be saying ‘What are you staring at ‘But then we have come to expect that from Eyke. There is that man Will again. I think his middle name is Duracell. The chickens usually get the pups very excited but I think the hot sunny day had taken its toll and they were exceptionally well behaved. I was extremely impressed with the pups today. They were very confident and other than a little bit of over excitement in the early stages which is to be expected the pups were very steady and sensible. My thanks to Andi and her family for all of their help and making it such an enjoyable day. I look forward to coming back again soon. Because of the success of our puppy program it is many years since we have accepted an adult dog being offered to us from a member of the public. I will always follow up on any dogs offered to us because although it is unlikely that we will need the dog there are many good Police forces who will. They wanted an active dog that would be part of their family but now that he is 12 months old they realise they cannot give him the amount of time and exercise this active dog needs. Their family circumstances have changed in that Natasha is very busy fostering children and Sean works long hours as a carpenter. Sean gets up very early to give him a long run in the morning and again last thing at night. During the day Natasha tries to give him attention but cannot give him what he needs. They are anxious for Gunnar to have a more active life and decided they would see if he had what it takes to become a Police dog. I went to see him at their home in Portland on the 5th of June this year. They were at pains to point out if being a Police dog wasn’t an option they would keep him. On my arrival he was very protective of Natasha and the house but in a confident way. He relaxed when he realised that Natasha was happy with me and I immediately liked his happy, playful confident demeanour. I could see that he was a much loved dog and had been very well looked after. I explained to Natasha there was a lot of water to go under the bridge in terms of assessments and a medical if he was to become a Police dog. I explained that our force didn’t need a dog at this time but that there were many forces looking for a dog. I arranged to collect him on the 16th of July for further evaluation. As arranged I collected him and he stayed with me at my house for a couple of days while I assessed his potential. I liked his friendly energetic nature and I loved the way he was happy to play for as long as you wanted him to. I found him to be a very people friendly dog which is important, his nerves are strong and he has natural nose work ability. Environmentally I found him to be a very confident dog who is naturally very inquisitive. Here he is at our vehicle workshops showing that confidence and inquisitiveness with my van being hoovered after a new bracket had been fitted. 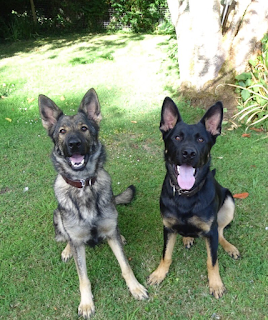 He is very responsive and is a dog that would quickly form a strong bond with his handler. I assessed his boldness with several courage tests and considering he is still very immature he stood his ground and stood up for himself. He was very confident with loud noises and heavy traffic. He certainly enjoyed playing with my female Ella. He clearly enjoyed his 2 days with me and Ella. When I returned him to Natalie and Sean I think they were surprised that he would quite happily have followed me and jumped back in my van. That tells me he is a dog with a natural aptitude to work and a dog who will be happiest if working. We have arranged for his hips to be x rayed and if they are good working hips I intend to take him into our Police program. So watch this space for further updates on Gunnar. A lovely dog who I really enjoyed working with over the 2 days. As reported in my last blog Quini has been released from the puppy program because on xray our vet deemed her hips not suitable for the rigours of Police work but that she will be fine as a pet. Here she is when I selected her and her brother Quest at 7 weeks from their breeder Walther Vebruggen in Belgium in August last year. Here they are in my garden aged 15 weeks when I brought them back to my house. I am happy to report that Quini now has a fantastic forever home with Gus and Sam. Tragically they only recently lost their retired Police dog Jasper aged only 5. Whilst we can never replace a lovely dog like Jasper I am confident that Quini will help Sam and Gus to recover from their loss. I would also like to thank Mark and Terri Boswell and Karen and Phil Goode for helping to look after Quini during her journey in our puppy program. As reported in my last blog her brother Quest has passed his assessments and will now be allocated to Mark Stevens for the September Initial Police dog course. Mark’s very successful dog Axel has had to retire prematurely aged only 5 with a spinal complaint. I have been waiting very anxiously for Ella’s hip and elbow scores to come back from the British veterinary association to see if we will be able to breed from Ella in the future. I am happy to say her hips and elbows are exceptional. Some good news for a change. From Ella, Larry and me bye for now.